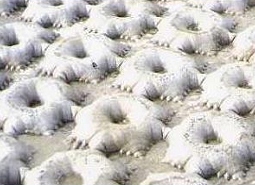 REVETMENT SYSTEMS GLOBAL'S Hydrostatic Filter Concrete Revetment Mattress is a rigid monolithic erosion treatment that consists of a double layered geofabric casing that is injected with a fine aggregate concrete infill. The specialised multi-directional weaving process employed allows the separate layers of fabric to be woven together at specified centres to form hydrostatic filters which allow the mattress protection to "breathe", relieving hydrostatic pressure from behind the installed structure. The HYDROSTATIC FILTER Concrete Revetment Mattress is a low cost, permanent and superior alternative to traditional methods of erosion control such as cast-in-situ or shot-in-situ concrete, stone pitching, rock armour or rock mattressing. 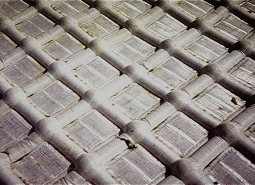 Due to it's unique fabric encased construction the HYDROSTATIC FILTER Concrete Revetment Mattress can be installed both above and below water and is available in a HD version which incorporates internal reinforcing ties. The versatility of design and installation of the HYDROSTATIC FILTER Concrete Revetment Mattress makes it suitable for an endless range of projects. REVETMENT SYSTEMS GLOBAL is proud to introduce FLEXBLOCK, a product of our commitment to ongoing product development. Whilst retaining all the features of the proven Hydrostatic Filter Concrete Revetment Mattress system, the FLEXBLOCK mattress system is designed to accomodate movement in the underlying ground. 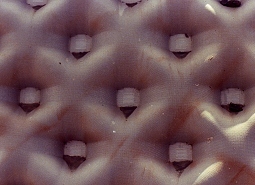 This feature greatly enhances the concept of fabric encased concrete erosion protection. 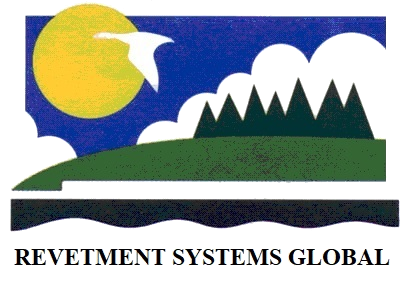 The patented weaving process developed by Revetment Systems Global creates a mattress divided into panels that are interconnected with grout tubes. These tubes allow the uniform inflation of the mattress. Each grout tube is designed to function as a shear point which allows each panel to move independantly whilst the fabric seam maintains the structural integrity of the protection. As is the case with the full range of protection systems offered by Revetment Systems Global, the FLEXBLOCK system can be installed both above and below water. The unique features of the FLEXBLOCK system offer an effective solution to erosion control problems that require a flexible protection system at a competitive cost. The FLEXBLOCK system is also available in a HD version which incorporates internal reinforcing ties. 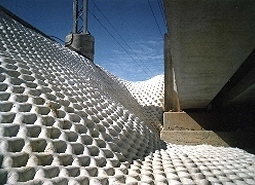 The product has been designed to utilise the binding and camouflaging effects of permanent vegetation, with embankment stability and protection maintained through the incorporation of a continuous grid of tubular grout injected fabric. The Growth Matt is laid over an existing or top-soiled surface and injected with a high strength grout. 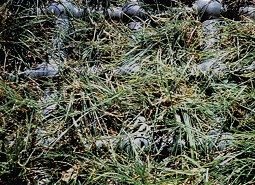 The fabric threads between the tubular grids serve the purpose of soil retention prior to the establishment of vegetation. Once the seeded area establishes itself, the fabric threads help to bind the vegetation to the grid structure, thus forming an integrated protective shield against erosion. As depicted above, the fabric can be coloured on site or in the mill to further camouflage the product. 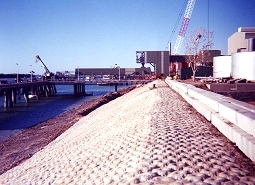 Product applications vary from perimeter drains to diversion channels, low velocity floodways, embankment protection and landscaping works (pebbles can be spread over the area to replace vegetation). The efficient use of grout throughout the system provides an effective alternative at a very affordable price.